The SIG P238 is a compact and small handgun, intentionally built for concealment. The P238 is an amazing choice of a concealed carry firearm for daily use. But eventually, carrying a firearm requires a good and reliable holster. With a plethora of options available on the market, choosing the right fit for your needs might be a tedious task sometimes. To help you get rid of this problem, this article talks about some essential qualities to be seen before choosing a holster for your SIG P238. Additionally, we have also searched and reviewed the best holsters for the SIG P238 available on the market. Are All SIG P238 Holsters the Same? Absolutely, not. The case with holsters is just the same as any other product. Holsters differ in material, design, level of concealment, and several other factors. The first and foremost feature is the wardrobe. There are several different styles of holsters used for carrying and concealment. These include ankle holsters, IWB (Inside Waistband), OWB (Outside Waistband), Shoulder Straps, pocket holsters and gun belts. Each of them has their own pros and cons. Shoulder straps, for example, allow you to carry two extra mags, but the position of your holster poses a threat to people behind or beside you. Other important features are the adjustable cant and locking mechanism for retention. Several holsters provide an adjustable cant feature which allows you to angle your holster at your desired position while it is attached to your belt. Several holsters feature a locking mechanism like the ALS, the SERPA or the retention screw to prevent the gun from falling out of the holster, and providing a secure storage for your SIG P238. Apart from these, some holsters are made up of kydex or simple polymer material, which are not very comfortable when carrying or sitting. When it comes to comfort, leather or hybrid material holsters are the best. What Makes a Great SIG P238 Holster? There are a few qualities that make a great P238 holster. We have segregated and reviewed the products based on these qualities, which make a P238 holster ideal. The P238 is a small and compact firearm, designed intentionally to act as a concealed weapon. A good P238 holster must serve this purpose precisely. You don’t want your holster to outline itself over your shirt or T-shirt making people anxious around you. A good P238 holster, must, at all times, cover the trigger guard of the handgun. There are holsters around the market which don’t do this, and you should avoid them. The reason is that an exposed trigger guard might catch onto something and accidentally fire your weapon. Additionally, when you draw your weapon, there are chances that your finger might get stuck over the trigger resulting in accidental discharge. A good P238 holster must offer comfort to the bearer. Choose wisely the material of the holster, and the paddle so it doesn’t bruise your skin or make you feel uncomfortable. A great P238 holster must offer reliable retention and a quick and safe draw for your weapon. Additionally, a holster must fit close to your body and must not wobble much as you move. Now we're going to move onto the review portion of our article and take a look at some of our top picks. We're going to explain each holster's main features, as well as some common pros and cons. Let's get started. The Desantis Nemesis pocket holster features a nylon material construction and fits the P238 like a glove. The holster can fit inside either of your pant or jacket pockets and protects your P238 from scratches. The material of the holster is viscous and breathable offering comfort to the bearer. The holster is a bit sticky like fly paper, so it doesn’t move much around your pocket. The foam does not break up the outline of the gun, offering high concealment. The holster doesn’t have any retention mechanism or locks, but the gun still fits snug and holds its place. Fits the P238 like a glove. It Has A Slick Pack-Cloth Inside. It Is High On Concealment. No Retention or Locking Mechanism. No Paddle Or Belt Attachments. The Nemesis holster is a lightweight and sleek cover for your P238. It is often good for carrying your handgun in your pockets or purse. It is less of a holster and more of a cover for concealing and protecting your P238. However, it is still easy to carry. 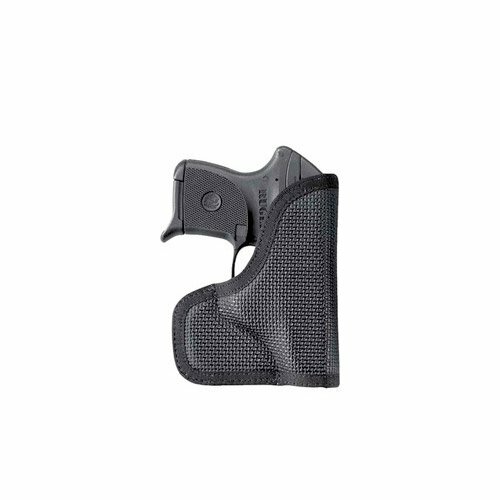 This holster from Concealment Express features a molded kydex body which offers a pre-formed mold to hold your P238. It is an IWB (Inside Waistband) type holster which features a retention tightening screw to adjust the amount of friction for your draw. The carry angle can also be adjusted between a range of 0 to 15 degrees. The standard ABS plastic belt clip can be attached to belts of 1.5 inches in width. The trigger guard stays covered in this holster and the ‘click’ audible retention lock system helps in ensuring security. Kydex Might Feel Uncomfortable While You Sit. It is a perfect holster for carrying your P238. The IWB design helps with the concealment and the locking plus ‘click’ mechanism makes its use secure. The adjustable cant and retention offer you the choice to use it the way you want. Integrated sweat guard adds comfort, but kydex might feel annoying when you fit, or if you are skinny. The CYK Supply Co. Holster is an IWB type holster made from Boltaron material, which is similar to kydex. 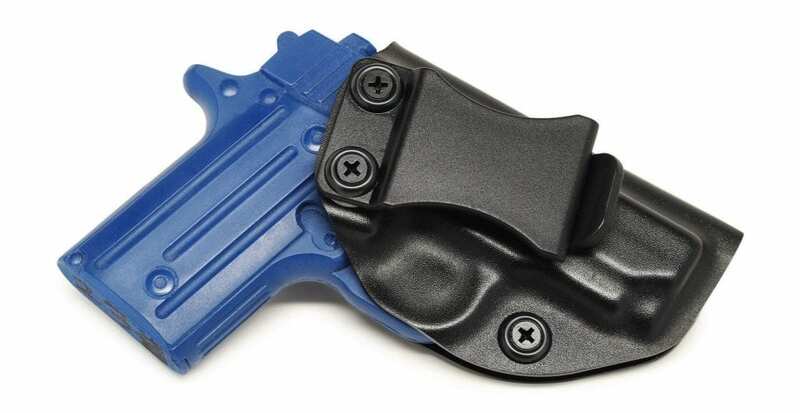 The holster can be clipped on to the belt, and the retention friction and the cant can both be adjusted using an Allen key provided with the package. The sweat guard covers full-length of side and the posi click audible retention system makes you aware when the gun was locked. The holster clips on tight to the belt, preventing any wiggle. The trigger guard remains covered which is good and safe. Though the thermoplastic material might not feel very comfortable on the inside due to the outline on the outside, it is still a matter of personal choice. Adjustable Retention and Cant Mechanism. Posi Click Audible Retention System. Draw Might Feel Tight Sometimes. Holster Outline Might Feel Uncomfortable While Sitting. 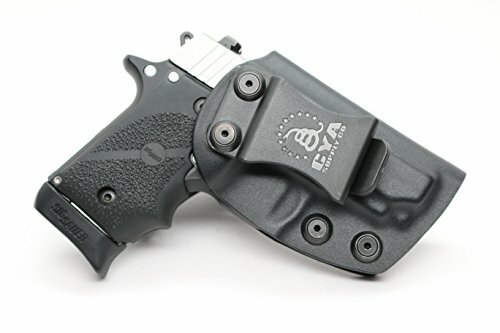 The CYA Supply Co. Holster is an exception IWB holster for your P238. It is a veteran owned company, and the service is excellent. The holster is rightly priced, offers concealment, and has adjustable cant, and retention mechanism. The holster is overall a good choice for a person with a decent budget. The ankle is probably not a very popular point to holster a handgun. But still, there are people out there who need ankle holsters. They come in handy when you want to carry a gun in such a way, that it does not meddle with your everyday life. This ankle holster lets you forget that you are wearing a gun. It's made from breathable neoprene fabric which sits soft and is comfortable on the skin. 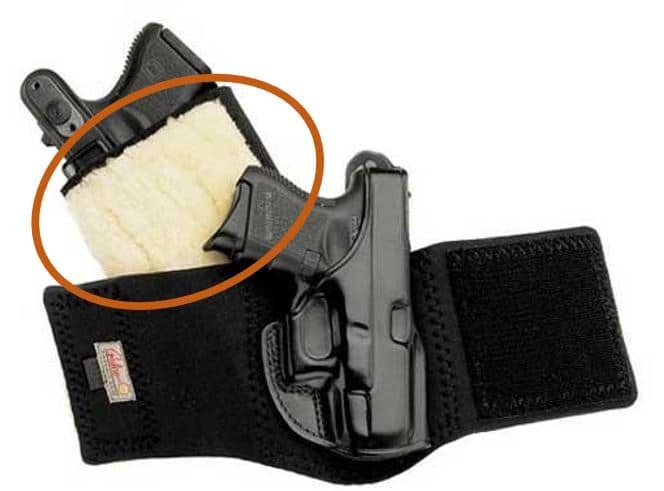 The velcro straps help in adjusting the ‘one-size-fits-all’ design of this holster. It also features an additional compartment to hold an extra mag. The bonus retention strap helps in securing the holster tightly for added peace of mind. This holster can hold most guns and has an ambidextrous design to use with either right or left leg. Good for keeping a backup handgun. Not Fit For People With Very Large Calves. The Ankle Holster is a perfect solution if you want to forget the adjustments to your P238 holster while you carry it. This holster is soft and comfortable and allows you to carry an extra mag. The draw times with this design are higher, but it is still a good fit for keeping a backup weapon. Obviously, this review would be incomplete if we didn't mention the very famous ‘James Bond’ style shoulder holster. No doubt this holster looks splendid and classy. 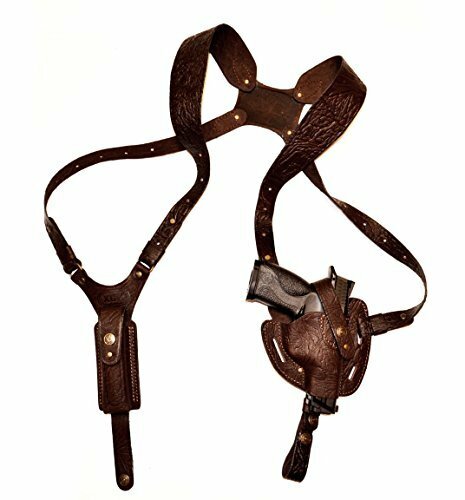 The entire shoulder holster is made up of 100% genuine leather, and the straps are adjustable. 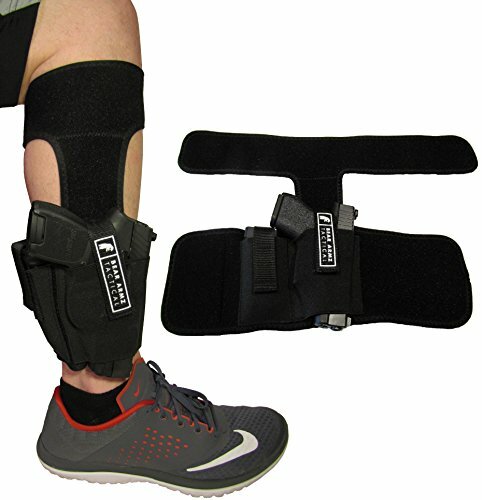 The holster features an adjustable retaining strap with Velcro so you can adjust it according to your convenience. The holster works well with several guns other than the P238. So it might be a ‘one-for-all’ package for you. The other end of the holster features a magazine holder, which can also be detached and used with your belt separately. The hoops on the padding of the holster make the pointing direction of the barrel adjustable. It can be adjusted so the barrel may face backward or downwards. Requires Jacket or Suit For Concealment. Might Feel Congested On the Underarms. The Shoulder Holster is a good choice for people working in the private security industry or for people who like to open carry. The holster offers extra space for a magazine and is also adjustable for the barrel pointing direction. Not a bad choice for someone inclined towards these type of holsters. The P238 is a small and compact firearm which is perfect for concealed carry. There are a ton of holsters on the market, and some of them differ from others based upon several qualities like material, design, locking mechanism, comfort, etc. A good P238 holster must offer concealment, should be comfortable, have good retention and can´t wobble much. Hope you´ll find the best holster in the above-mentioned reviews.